Despite great interest, the use of metal additive manufacturing in production applications has been limited by high production costs, slow printing speeds, complexity, and quality issues. Current methods take too long to be practical, or require the use of dangerous materials, specialized hardware, and multiple complex finishing steps involving shrink compensation software, chemical baths, and furnaces. Look past the hype around metal 3d printing, and you’ll find it’s rarely used in manufacturing. Low production costs require both an inexpensive raw material and high printing speeds. Printing speed is gated by how quickly heat moves to the desired melting location. Metal 3D printers work by positioning and then melting raw material to build up 3D parts. For optimal speed, cost, and repeatability, the process should use as few steps as possible. Repeatable quality requires an ability to directly measure and control the melting process. Rapid, precise motion and wire feed systems position the tip of the wire in contact with a desired printing (melting) location. Once the wire is positioned, the system pushes current through the wire and part being printed and into the print bed. The current melts the wire tip using joule heating (aka “resistance heating”), the same physics that heat a coil in a toaster. Melting and wire feed continue while the print head moves, laying down beads of metal which are fused together to form fully dense metal parts. A key is that positioning and melting of the wire occur simultaneously in a single step. This radical simplicity lowers cost, saves time, and increases repeatability. There is no need for powder handling, feeding and spreading, no need for binding/debinding, and no need for sintering – and no need for the costs, time delays and variability these steps introduce. Joule heating is the most efficient way to convert electrical energy into heat. Because the wire melts from within, there is no wait for heat to move to where it’s needed. Melting occurs instantly, exactly at the desired location. Our first system leverages this to print at 5‑10kg/hour at very low power (<1 kWh per kg). Joule Printing™ provides precise closed-loop control of melting at the voxel level. Since the wire is held in a precision motion system, we know exactly where the melt is deposited. Unlike a direct energy deposition system, there is no dripping or splashing. We use the precision wire feed system to measure and control how much metal goes into the melt pool. The electric circuit provides measurement and control of how much energy is applied to the melt. This combination of tightly controllable process parameters allows the system to deliver consistently dense (99.5%+) isotropic parts that are stronger than castings. In addition, the process data for every voxel is saved for post analysis. 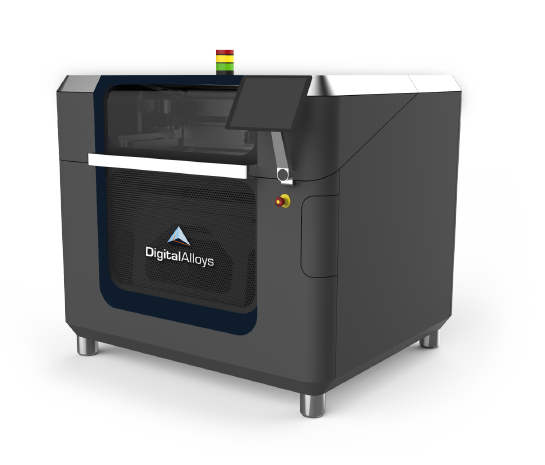 In combination with our machine learning technology, this provides the capability for non-destructive QA of printed parts. We are pleased to introduce Joule Printing™, the first metal 3D printing with the speed, cost and quality needed for production. Welcome to a new age of manufacturing.